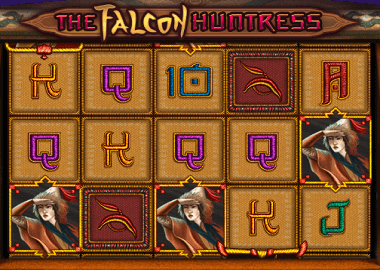 The Falcon Fortress is a 5 Reel, 3 Symbols online slot from software developer Thunderkick. The company is based in Stockholm and is a young iGaming company. Thunderkick specializes in casino software and online casino games. The young company has only been on the market since 2012 and has so far released 24 online slots – the latest is The Falcon Huntress. Theme of the game is the Mongolai and more precisely the falcon huntress. As in the past, this game has only 9 paylines – so you have the best overview of your winnings while playing. Although Thunderkick did not use eye-catching features in the game, it still offers smooth gameplay. The low symbols are traditionally the map symbols 10, J, Q, K, and A. Symbols that produce more valuable gains are corn, a feather, a bird’s nest, the hawk, and the hawk huntsman. The 9 paylines are fixed, which means you can only choose your bet per line before each spin. Expanding Symbols feature: Even in the base game at The Falcone Huntress Slot there is the wonderful expanding symbol feature. Feature starts automatically when you get any win. Increase your profit symbols until the whole roll is covered. Depending on the symbols you will get very good winnings already in the base game and especially if the falcon huntress symbol appears. The feature works for every symbol except the wild symbol. Free Spins Feature: While the falcon huntress symbol has the highest value in the base game, the golden falcon is your ticket to the bonus game. Basically, the golden falcon is also your wild symbol and replaces all other symbols when forming paylines. Depending on how many symbols land on the reels, you get a win multiplier of 2, 20 or 200 times your bet per line. If you get from 3 or the golden falcon, the bonus game starts with 10 free spins. Also in the Free Spins feature you get the expanding symbols. Here you can win up to 10.052 time your stake! The Falcon Huntress has a theoretical return to player of 96.1%. Unlike most new online slots, the game only has 9 fixed paylines. This will be appreciated by all experienced players who like Novoline, Playtech or Microgaming slots. You can play from £0.10 and the maximum amount is £100. The game is programmed in HTML5, which means you can play it on desktop, tablet and smartphones. You can play the reels on The Falcon Huntress here (click on the top banner and play for free without limit) or in the casinos recommended below. All our casinos are UK licensed and meet all criteria for fair gaming. Of course you can also use the bonus offers when you register. There are more bonus spins and extra bonuses to play for you. Enjoy The Falcon Huntress and other Thunderkick slots wherever you play.